Most evening meals in restaurants are served with some sort of complimenting wine. It enhances the atmosphere, encourages conversation, and helps create a pleasant night out. However, this relatively simple addition to a meal can be difficult to replicate for dining in the home. There is a wide variety of wines, and each one can add a specific accent to food. So, the question becomes this – how can those at home choose the best wine to serve with a meal? The good news is that the process is fairly straightforward after learning about the principles of pairing. Before the wine cupboard can be cracked open, it is important to understand what wine pairing is. Wine pairing is the art of choosing a wine that will enhance and compliment the flavor of the food being served. Different wines tend to work better for different main meats – red wine for steak, white wine for fish – but this isn't to say that these are hard-and-fast rules for wine pairing. Let's say that instead of crisp wine served with something salty, a sweeter wine was substituted. It isn't necessarily the wine that most people would think of, but the sweetness of the wine can help offset and accent the saltiness of the food. Ultimately, wine pairing depends on the individuals' creativity and palate. The only limit to it is the willingness to test-drive new flavor experiences. Wine has been in existence since Biblical times. It was often more sanitary than water supplies, and as such, was a staple at meals. The practice of wine pairing grew as the winemaking tradition developed – for example, Italian wines generally have a high acidity, and while they may be a bit strange to drink on their own, the entire experience of the wine changes when it is paired with Italian cuisine, as the two evolved together. Wine pairing as a cultural trend didn't really appear until the 1980s, and winemakers began to market their wines with specific kinds of food. Some pairings are based on the instinct of the winemaker or evaluator, and some are based on the scientific chemical compounds found in both the food and wine. Whatever the method used, wine pairing is a skill and a rising hobby for many food enthusiasts. The most common rule of thumb with regard to winemaking is a simple one – the wine should match the color of whatever sauce is served with the dish. Spaghetti, by this rule, would benefit most from a red wine. Fish with a citrus-mushroom sauce would best be enjoyed with white wine. If the dish does not include a sauce, make the meat the main attraction. Lamb or heavier meats favor a red wine in general, and chicken or fish (lighter meats) accordingly go with lighter, white wines. For a more tailored culinary experience, other factors must be considered before making a final decision. 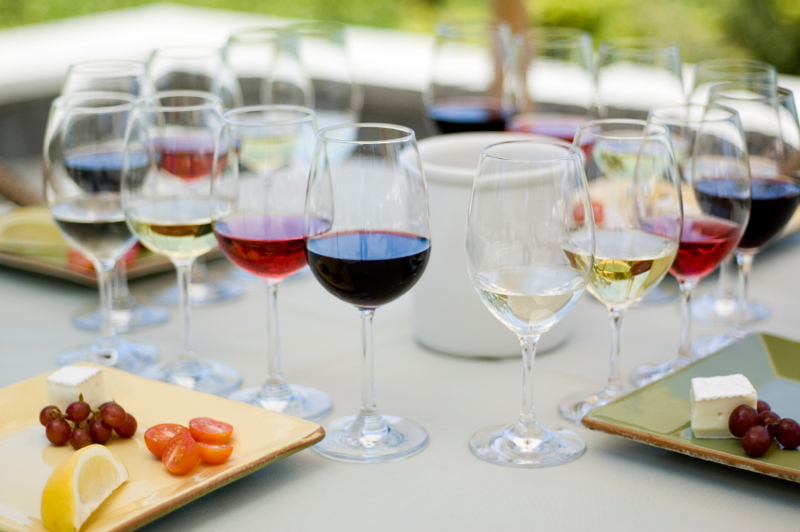 Food and wine share evaluating characteristics like flavor, texture, color, and smell. Most foods will do well to be paired with a wine “twin”, or one that shares certain characteristics of the food. A more advanced method of wine pairing is choosing wines that are the direct opposite of the food in some regard; as this technique is similar to pairing dissimilar foods (bacon and apple in a salad, for example), it requires practice to get the balance of flavors correct. The magic quality of a food-and-wine pairing is the balance of the entire meal – the wine should not overpower the food, or vice versa. It's fairly easy to decide between red or white wine for a dish. Choosing a subcategory of wine is a bit more difficult. Red wine may go well with spaghetti, but a dry red wine, like Zinfandel or Cabernet Sauvignon, will have a much different taste than a sweet red wine, like sweet sherry or port. To decide between the two, take into account whether or not the sauce has strong spices or citrus flavors – if it's more on the acidic side, a dry wine would be a better choice. If the sauce was made with sugar, then perhaps a sweeter wine, like Pinot Noir, would be the best decision. Ultimately, it is up to the palate of the diner to decide what wine would partner best, and the only way to know for sure is through experimentation. Whether it's cooking the meal with wine or serving wine with the meal, the variations of meal combinations are endless. Cooking with wine can help make the dish more comparable with the wine, but if that's too ambitious for a newcomer to wine pairing, an easy exercise to develop wine selection is the pairing of wine with fruit or cheese. Cheeses tend to have very distinctive textures and flavors, and the difference between cheddar with Merlot and cheddar with Chardonnay is readily apparent to even first-time tasters. The best advice is simply to experiment!